or the joyful pop reverie of “Just Passing Through” or “The Good Life”. A rich selection of tasty treats! Whilst the songs may well be quite diverse in style and mood, there is a common thread that links these musical gems---the voice of Lenny himself. It is this that moulds these tunes into a single, delicious package. The songs can be savoured one at a time or in a single sitting. Either way, you are in for a real delight. Some seriously good music on this album, get yours today! Congratulations on such a good album, man! Lenny is THE MAN! So much talent so little time. I bought the CD because I believe in the music and I believe in the MAN! I especially like "Someone To Listen". His voice has a star quality I don't even think he's aware of. This IS the box o' chocolates! In this album, there are many type of songs. I couldn't believe that the same artist has created 'Just Passing Through' and 'Stop Your Crying' when I listened to them for the first time. And now this album leads me to comfortable places. Top C.D. in my car! Like most people, I listen to CDs in the car. 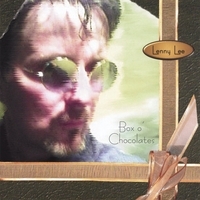 Lenny Lee's Box o'Chocolates is my number one pick. The diverse selection of songs makes it great for repeated listening, never tiring, I keep hearing new little nuances that keep the music interesting. If you like the Beatles, Todd Rundgren or Peter Gabriel, this is a must have CD. I heard Tomorrow maybe 2 years ago. I'd not heard Lenny sing prior to that (where the hell had I been? LOL) and didn't know he was the man on bass either. Anyway, the track blew me away. Awesome intro, awesome song. Infact, that's what this album is all about, no matter what your taste, the song's likely to be there for you on this album. Don't get me started on The Good Life. Ain't that the way to close an album? So optimistic, so beautifully played and performed. Great album Lenny, some great performances too. Loved it.